Is your garage more of a storage unit than, well, a garage? Is it full of boxes and furniture instead of a car or two? Are your shelves bowing under the considerable weight of memories past? Do you ever wonder what’s buried in that dark corner under the canvas tarp? Do you WANT to know what’s under there? If your garage is anything like mine, then no, you really don’t. I’ve talked on this blog about how organized I am (or have deluded myself into thinking I am), but my garage is scary with a capital S. The only part that makes any sense is my laundry area. Other than that, I could have a whole colony of gnomes living amongst the leaning boxes and humped piles of storage bags. My big fall project is garage organization, and frankly I’m terrified of what I’m going to find. I’m trying to psych myself up to it by treating it as an archaeological dig and we’re looking for the Ark of the Covenant or a crystal skull, but I haven’t made progress with that. What I have made progress with is starting to purchase the tools we’ll need to get it organized and hopefully stay organized! After I talk myself into NOT saving everything. I’ve taken the liberty of listing a few of the things that I’m picking up to get the garage in shape, so hopefully they’ll benefit you as well. Happy organizing! Shelving – sturdy shelving, preferable with doors, is the first step in successful garage organization. It can take the weight, and instead of seeing paint cans strewn everywhere, you see nice, neat doors. Organizers – Specifically wall mounted ones. They are perfect for hanging mops, brooms, rakes, etc. Most have latches AND hooks, so you can hang rope and extension cords as well. Work spaces – We’re purchasing a mobile work station instead of building one. Its more convenient for us, as neither one of us plays with power tools to build things, and we can move it around the garage for more space. Garbage Cans – Heavy duty and not prone to breaking. We bought two of the Rubbermaid Brute garbage cans and they contain all of our refuse until garbage pickup. 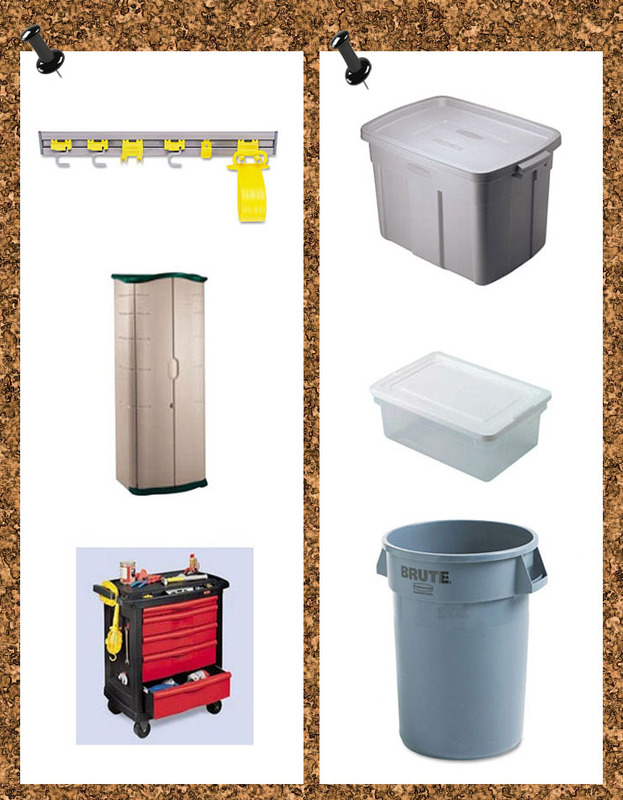 Storage – Bins and boxes. Perfect for everything from books and albums to nails and screws. You can’t go wrong with a hefty supply of both. Plus, you can use them up in your attic and turn that room into scary hoarding storage space.